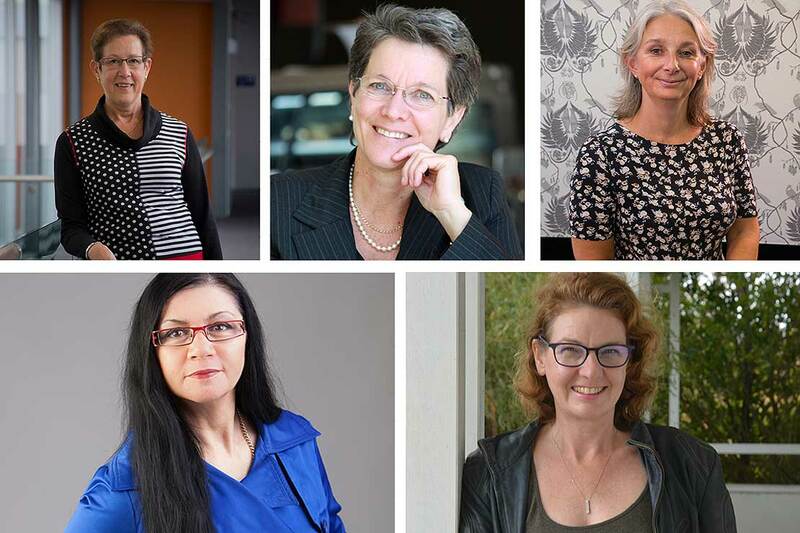 For the second year running, Massey University is well represented in the New Zealand Women of Influence awards, with five staff, 14 graduates a student named as finalists. Five of the nine finalists in the Innovation and Science category have a Massey connection, among them Professor in Construction Robyn Phipps and Professor in Nutritional Physiology Marlena Kruger. Others nominated in the category are Sarvnaz Taherian (Bachelor of Arts, 2008), and Dr Hinemoa Elder and Dr Mahsa Mohaghegh, who graduated with doctorates in 2012 and 2013, respectively. Ms Taherian is also a finalist in the Business and Enterprise category and Dr Mohageheh is also a finalist in the Diversity category. The awards, part of the New Zealand Women of Influence programme, aim to recognise and celebrate those who make a difference to other New Zealanders. In the Global category, sponsored by Massey, are Anne-Maree O’Conneor (Bachelor of Science, 1985), who is also a finalist in the Board and Management category, Sian Simpson, Diploma of Business Studies (2014), who received the Massey University Award for Excellence in IT, Innovation and Science in 2015, and Samantha Jones, who after graduating with a Master of International Security in 2014 went on to found Little Yellow Bird, a Wellington company that designs and sells ethically manufactured workwear for corporates. Massey Assistant Vice-Chancellor External Relations and Development Penelope Barr-Sellers says the University is proud of it support for the awards. At last year’s awards, it announced the appointment of new Vice-Chancellor Professor Jan Thomas, the third woman to lead a New Zealand university and the second to head Massey. Professor Claire Robinson, who heads the University’s College of Creative Arts, is a finalist in the Arts and Culture category, alongside former Chancellor Morva Croxson and chart-topping record artist Lizzie Marvelly (Bachelor of Arts, 2015). Associate Professor of Public Health Marewa Glover, whose research addresses health threats to Māori, is a finalist in the Public Policy category, alongside Distinguished Alumni Service Award recipient and former Massey Professor Dr Judy McGregor (PhD in Business, 1996). Fellow of the New Zealand Institute of Primary Industry Management and Professor in Farm and Agribusiness Management Nicola Shadbolt is a finalist in the Rural category. Others nominated in the category include Carla Muller (Bachelor of Applied Economics, 2013, Bachelor of Environmental Management with Honours, 2014, and Master of Environmental Management, 2016), who has also been nominated in the Young Leader category; Hayley Hoogendyk (Bachelor of Business Studies, 2010); and Tracy Brown (Bachelor of AgriScience with Honours, 1992). Other Massey finalists include Minnie Baragwanath (Bachelor of Arts, 1990), who is a finalist in the Diversity and Community/Not for profit category; Dianne Daniels (Diploma in Teaching, 1976), who is a finalist in the Diversity category; and Shahed Abu Jwaied, who is a finalist in the Young Leaders category. The winners will be announced at an awards dinner at the SkyCity hotel in Auckland on September 7.